Fully Refurbished. 2 Bedroom. 1 Bath. Sleeps 4. New Kitchen. Living, Diningroom. 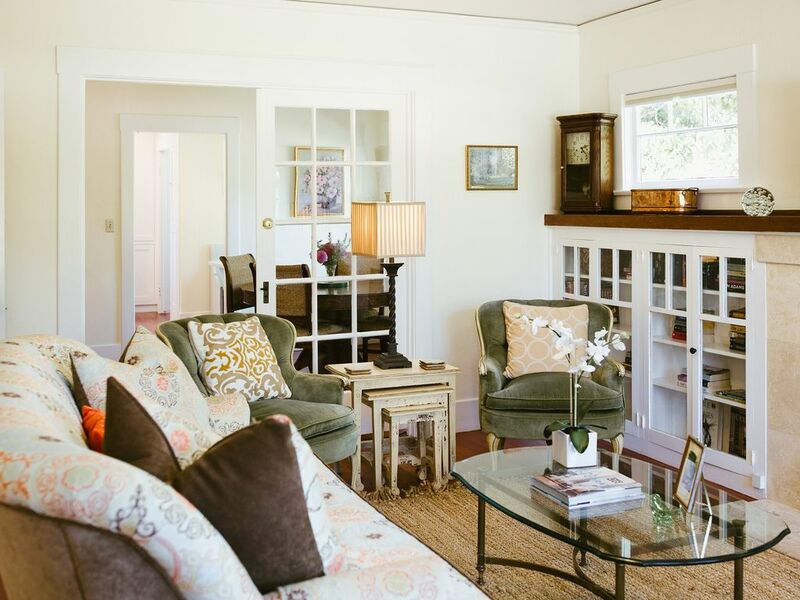 Charming 1920's Bungalow right down town San Luis Obispo Homestay 112769 If you like the downtown experience, this home is perfect for you. Thanks to San Luis Obispo's new hosting policy - Homestay - , we can now share our down town living experience with you. I grew up in San Luis and probably didn’t really appreciate all it had going for it until we moved away for about 20 years. The Bay Area is nice, but there’s something about the small town vibes of San Luis that keep you from missing the Bay Area traffic. We bought the DownTown house in 2013, rented it out for a year, fixed it up, landscaped it, and moved in. First time we had ever lived in a downtown location. We actually felt kind of hip at times. If you’re looking for a quiet get away by a flowing stream, this may not be for you! If you want the urban downtown experience in a laid back town, in a cute early 1900’s home, and are ok with the city noises - then this will definitely work. Here's a few high points. A cute, old house. Early 1900’s. Maybe 1914. A lot of original character. Great old vertical grain doug fir floors. Upgrades – Like a new kitchen. New appliances. Countertops crafted out of 100+ year old barn wood. Forced Air including Air Conditioning. Funny you wouldn’t think you need this in SLO, but downtown can get warm. AC is a plus. Inside laundry center. It’s small, but it’s a nice convenience not usually seen in these old homes. Location – Right downtown! It’s a fantastic launching pad for visiting the city and county of San Luis Obispo. It’s just a 100 steps from the back door to a hip coffee shop – Black Horse. Four blocks to the hippest coffee shop – Scout. A block to the best tri-tip sandwich at Firestone Grill. A great park right around the corner. Great hiking right from the front door. Gus Grocery Sandwiches a nice 3 block walk. Terrace Hill is a 2 mile loop with great views of town. Wineries within 10 minutes. Beach within 15 minutes. Bike from house. Great road and mountain biking trails. Great local restaurants. Farmers Market every Thursday evening. Best Farmer’s Market in California. A block from the house. Bike night follows on the first Thursday of the month. toilet, combination tub/shower, Glass shower enclosure. Truly right downtown. One block walk to Farmer's Market. Great kitchen. New everything - but restored to keep character of 1920's bungalow. Dishwasher, Range, Refrigerator. Microwave. Coffee maker with coffee supplied. Great built in's from the 20's. A random collection. Help yourself. Ocean kayak in Avila, Morro Bay or Cayucos. Short drives. All have rentals. Outdoor seating area. Great spot for coffee. A few blocks away. SLO High School. Great public courts! Moro Bay. San Luis Bay. Dairy Creek. 3 great courses 15 minutes away. This is a homeStay house. Due to traveling schedules, run of home is available many times throughout the year. Please contact for details. Enjoyed the details of the house, keeping the updates to match the original built-ins. Nice to walk to and around town. Lots of street noise during the day especially with some march that started at a nearby park but otherwise quiet. We were in town for a December campus event, and we already know our way around downtown SLO pretty well. So we were right at home being walking distance to EVERYTHING, even campus if you're in the mood for a medium walk. Off-street parking was super handy, especially in that area where parking can be competitive. The house itself was very comfortable, and plenty of room for 4 adults (just one bathroom tho, although was never an issue for our crowd). Kitchen was well appointed, and laundry was easy. Great eating spaces. Very pleasant and welcoming neighbors. The only possible downside is street traffic noise, which was never a problem for us, even for sleeping. If I could magically add one thing it would be a little more room outside for a larger patio table (current setup is just a cafe table for 2), because being outside is always simply wonderful in SLO. And for the Uber rides, there was always a driver less than 5 minutes away. We would re-book again without hesitation. Thank you! Perfect house for a relaxing weekend getaway! The house was adorable and charming. It was so close to downtown SLO which had amazing restaurants. The kitchen is beautiful and is fully stalked with everything on might need. The house was clean and the decorations were so beautiful and unique. Perfect house for a quiet and relaxing weekend getaway! We were in town to see colleges and this house was perfect. Great location! David and Lauren were quick to reply with answers to our questions and made our stay at their home flawless. The house was clean and comfortable, we felt at home the moment we opened the door. We will definitely be back!!! Super cute,comfortable cottage! All the comforts of home! We loved being able to walk everywhere! Absolutely perfect in every way! Looking forward to staying there again! Would highly recommend! What a wonderful property! Charming bungalow that has been redone enough to make it super comfortable yet not so much it loses its historic charm. Within walking distance to downtown SLO and many restaurants. Our only regret was not renting it for a longer period of time. The hosts are thoughtful and considerate of their guests as they’ve thought of everything one might need to make the stay enjoyable. Truly a wonderful property! Here’s a few of our local favorites. All within walking distance. Coffee: Blackhorse is the shortest walk. Go across Marsh. Left on Higuera, it’s on the left. Good local roast and brew. Scout Coffee is the hippest. Great owners. Friendly staff. Really like their cappuccinos and lattes and their pastries are amazing. Or try the Honey Bowl if coffee isn’t your thing. They are on Garden. Walk down Pacific about four blocks. Right on Garden. Cross Marsh Street and they are on the right. They just opened a brand new beautiful café on Foothill Blvd over by Cal Poly in the hip, renovated University Square shopping center. The Garden Street location is cozier and very walkable, but the new place is worth checking out. Sally Loos. You can do a full breakfast here as well. Good coffee and great Acai bowls. Walk down Pacific to Osos. Left on Osos. They are up the street about 4 blocks on the left. Another great option is Bello Mundo Café – Santa Rosa and left on Monterey towards Mission. A great cappuccino and typically a music event going on in evening. There are many other coffee shops downtown including Peets and Starbucks. Breakfast: Sally Loos – see above. Del Monte Café: A little bit longer walk but not that far. Walk down Pacific. Cross Osos and make a left on Osos. Stay on right side. Go up about 4 blocks. Osos turns into Santa Barbara Street. Del Monte is on the right about 2 blocks further on Santa Barbara. Splash Café: Great breakfast tacos and burritos. Cross Marsh and take a left. Go down about 2 and half blocks. Past Morro street. Turn right at Chronic Tacos by Jamba Juice. Splash is past Starbucks on the right. Louisa’s Place: Been here forever. Huge omelets. Nothing fancy but always gets voted best breakfast. Walk down Santa Rosa to Higuera. Left on Higuera. Two blocks down on right. Just past Peets. Blue Sky Café: A little nicer ambience than Louisa’s. Good food. Walk down Pacific or Marsh about 5 blocks. Make a right on Broad. Blue Sky is between Marsh and Higuera on the left side of Broad. Lunch: Firestone: Best tri-tip sandwiches. Great salads. Great burgers. This is a college kid, family hang out. Cross Marsh and make a left. Right on Osos. They are on the corner of Osos and Higuera. Follow your nose. Gus’s Grocery: Great sandwiches. Great crew. Great patio to hang out. Down Pacific. Left on Osos. A block past the park. By Starbucks on Marsh you will find Splash Café – good fish and chips, Chronic Taco and other decent lunch spots. Make a left on Higuera and there are Thai restaurants, The Habit Burger is on Higuera. Make a left on Chorro and Eureka Burgers is on the corner of Marsh and Chorro. Great burgers. High Street Deli – funny enough located on High Street. If you’re up for a nice walk through older SLO neighborhoods, it’s a nice 1 mile walk. I would head south on Buchon or Pismo and make a left on Carmel Street. You will run right into it. Nice garden patio and great sandwiches in an old market. Deep discounts after 4:20 every day. late night music. SLO Brew just relocated and opened up on Higuera by Garden Street. They did a great job on this new location, and although known for craft brews and late night music, it is very family oriented for lunch and early dinner. Foremost Winebar: Owned by the owners of Tooth and Nail winery in Paso. Really nice restaurant. About the farthest walk but under a mile. Santa Rosa and make a left on Higuera. It’s down about 6 blocks. Past Nipomo street. Ciopinot: Tell Leonard the Bowin’s said hi. Great place and great seafood. No corkage fee. It’s right by Foremost, on Nipomo Street. Goshi’s Sushi: Best sushi in town – is back behind Ciopinot. Get there early if you don’t want a long wait. They will let you leave a phone number and you can walk around. Sidecar: Great Brussel sprouts. Great burger. Known for their cocktails. On Broad street. Walk down Pacific or Marsh. Right on Broad. They are on the left. HomeStay house. Contact owners for dates on when full house is available. Minimum stay is 3 days on Memorial Day and Labor Day Weekends. 4 Days for Thanksgiving and Christmas.